The underlying concept behind CBT is that our thoughts and feelings play a fundamental role in our behavior. For example, a person who spends a lot of time thinking about plane crashes, runway accidents, and other air disasters may find themselves avoiding air travel. The goal of cognitive behavior therapy is for patients to learn that while they cannot control every aspect of the world around them, they can take control of how they interpret and deal with things in their environment. Cognitive behavior therapy has been used to treat people suffering from a wide range of disorders, including anxiety, phobias, depression, and addiction. CBT is one of the most researched types of therapy, in part because treatment is focused on highly specific goals and results can be measured relatively easily. CBT enables one to see the relationships between the different parts of our experience. Cognitive behavior therapy is often best-suited for clients who are comfortable with introspection. In this work, individuals learn to see the links between the body, the mind, their behaviour and environmental circumstances which affects these. MBCT was created by Oxford professors Segal, Williams, Barnard and Teasdale in 1991. The theory is that being aware of experience in the present, instead of focusing on the past or the future, will allow the patient to be more apt to deal with current stressors and distressing feelings with a flexible and accepting mindset, rather than avoiding, and, therefore, prolonging and amplifying them. “The goal of MBCT is to interrupt automatic cognitive processes and diminish reactions to incoming stimuli, by accepting and observing them without judgment. CBT has been used across cultures successfully, but needs to be adapted according to cultural and local issues (Otto, et al, 2003; Udomratn, 2008). Studies suggest that community therapists can be trained in CBT for post-disaster distress in relatively short time spans with ongoing support in a real-world setting. This is especially important in emergency disaster situations, when a number of non-expert trauma therapists will need to deliver trauma services (Hamblen, et al, 2010) to large numbers of people (Kar, 2009). To support CBT application, culturally adapted explanations, symbolic representations and use of local language are of great support for trainees to build upon their existing skills and knowledge. In this way, they can deliver CBT treatment more effectively. The effectiveness of disseminating CBT for post-disaster distress to community therapists was studied following Hurricane Katrina. Following two days of training in CBT for post-disaster distress, therapists showed significant improvement in their ratings of the importance of various elements of CBT, their knowledge and understanding of those elements, and their confidence that they could use them effectively. Immediately following training, 90% of therapists demonstrated excellent retention of CBT for postdisaster distress (Hamblen, et al, 2010). 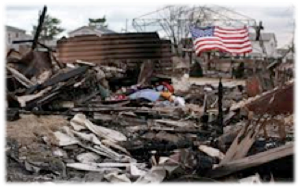 CBT for post-disaster distress, comprising 10 sessions, provided by community therapists addressing a range of cognitive, emotional, and behavioral reactions to disaster in adult survivors of Hurricane Katrina has been reported to be effective. Participants who were assessed at various phases of treatment showed significant and large improvements. The benefits were maintained at follow-up distress (Hamblen, et al, 2009).